Electric bicycles are an excellent way to travel around. They&apos;re quiet, low energy impact, very affordable, miniscule resources required to build them, able to fit into any place a non-powered bike can go. In New York City, electric bicycles are legal to own, but not legal to ride on the street. Apparently many in NYC have a mistaken idea electric bicycles are dangerous. 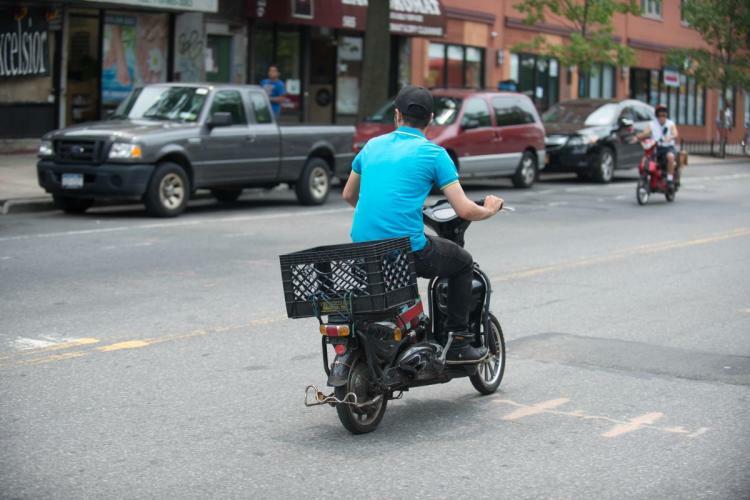 This news, that Mayor Bill de Blasio announced that the city would begin cracking down on electric bicycles, or e-bikes, by targeting the businesses that enable their usage, is troubling. New York City wants to clean up its environmental footprint. An excellent way to do that would be supporting electric bicycle use, especially for delivery services. I recently spent a week staying in the greater NYC area -- specifically in Flushing NY, which is part of Queens. Flushing has a huge Chinese population with the downtown Flushing area being primarily Chinese-oriented shops and restaurants. While walking the downtown area I saw dozens of electric bicycles in use, with many being parked outside shops apparently for deliveries to customers. We also went to Jackson Heights, in another part of Queens, and saw many more electric bicycles there. The picture above is fairly typical for the bikes I saw. The style is more like a scooter, but it has operable pedals that I expect are there more to fit legal requirements than to be useful pedals. Such an electric bicycle fits general regulations for electric bicycles -- motor power under 750 Watts, and top speed under 20 miles/hr. The article (link below) discussing Mayor de Blasio&apos;s crackdown repeats false ideas about electric bicycling. That, somehow, electric bicycles are more dangerous than non-powered bicycles. It&apos;s claimed that complaints about electric bicycles have increased significantly over the last three years. According to the article, NYPD&apos;s motor vehicle crash statistics show roughly 7,500 wrecks involving cars, SUVs, trucks, vans, and commercial vehicles, in Manhattan, in September 2017 alone. Only 193 of those wrecks involved bicycles. It seems, therefore, that bicycles, electric or otherwise, are not a big risk, nor are they causing a big problem. It seems the stereotypical complaint is are electric bicycle based delivery riders rushing to make a large number of deliveries. They might have multiple "delivery bags" indicating they&apos;re pushed by the bossman to rush through a series of deliveries. It therefore is plausible that such a delivery rider could cause a safety problem by not paying enough attention. But does the electric motor make the problem worse? I&apos;ve seen many news articles of pedestrians killed by collision with non-powered bicycle riders. Therefore, aren&apos;t all bicyclists possible dangers? What should be enforced is risky/dangerous bicycling behavior. Electric bicycles should be endorsed and applauded.